​Huge congratulations to two former St Mary Abbots pupils, Tierney and Lily who graduated from Oxford University in 2018. On Tuesday 8 March 2016 at 3.45 p.m., I welcomed three past pupils to St Mary Abbots School. Janie Hildebrand, Jean Martin and Gill Assael returned to school again. They had left our school in 1961 aged 11 years old to go on to Holland Park School & Godolphin & Latymer School. 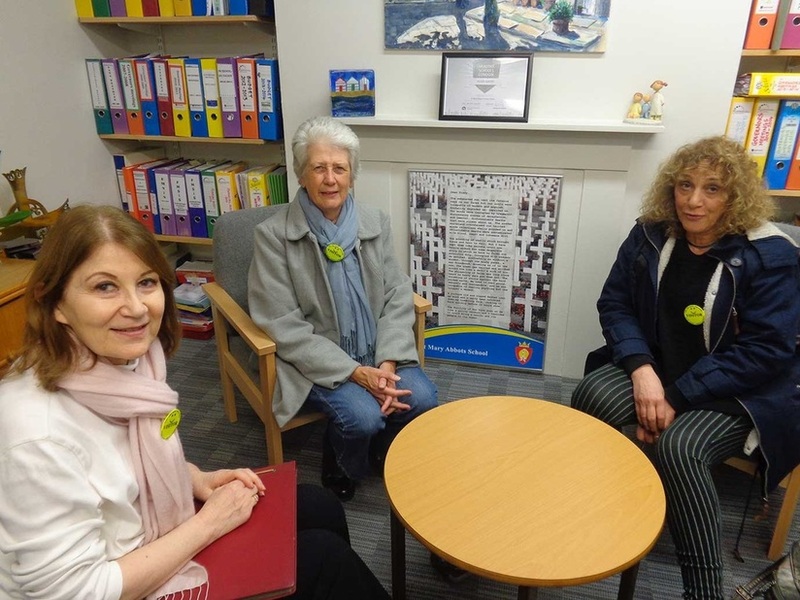 All three ladies were eager to see how the school had changed and reminisce about their happy school days here at St Mary Abbots. They told me fascinating stories of cold toilets in the basement, not being allowed to play football in the large playground, a trip to St Albans, chalk being thrown at pupils who were not listening and their being 33 pupils in one class. Below is a photo of the three of them together in my office during their visit. They all thoroughly enjoyed revisiting their old school and loved the changes that had taken place to the school so far. ​Trawling through the internet on a nostalgic trip, I decided to look at the SMA website where I saw an entry entitled Past Pupils Visit and immediately spotted a familiar face – Jane Hildebrand — and then recognised a familiar name, Gillian Assael, and the memories came flooding back. Like Jane and Gillian I was a pupil at SMA from 1956-62 (not 1961 as mentioned on your website) and was a member of classes taught by Mrs Jones (Reception), Mrs Blunt, Miss Maycock (2 years) and the formidable Mrs Fraser — who got our whole class bar two through the 11+ examination in the year when we had to be evacuated to a school in Notting Hill due to the failure of the heating. I am certain that the 11+ class had 41 pupils in total. On a visit to London a couple of years ago, I took a walk past the school and, other than the lack of railings around the gravestones in the churchyard, it looked much the same. The photo of your visitors in your office brought back memories of the then head teacher, Mr Hill and his secretary Mrs Brantingham (her son, Keith, was my best friend and we both went on to Emanuel School on leaving SMA). I still have a class photograph that was taken in 1959/60 which might be of some interest for your archives and I attach a scan of it below, along with a key to those pupils most of whose names I was able to remember many years ago. I left Emanuel School in 1965 when my family returned to Wales (my Kensington home had been in Queens Gate) where I completed my school education at Pwllheli Grammar School before going on to Bangor University where I gained a degree and a post-graduate qualification. I was a teacher for a number of years before setting up a history book publishing business and am the author of some 16 titles on either Welsh history or Welsh military history. Now retired, I have nothing better to do than to go through these old memories! I did have e-mail contact with Gillian Assael some twenty years ago but, due to a computer failure, lost all her details. Should you come across any pupils that I was in school with, I would be happy for you to pass on my contact details. Please excuse my ramblings, but I have very fond memories of SMA and am delighted the school continues to thrive. ​Back row: Charles Hastings (10), David Irving (9), David Kahan (8), Keith Brantingham (7), Peter Protapapa (6), David Logan (5), –?– (4), Malcolm Wiley (3), Richard Alford (2), Miss Maycock (1). Middle row: David Turner (23), Richard ? (22), Arthur Neal (21), Alister Williams (20), Patrick Heggart/Haggarty (19), Christina Marco/Marcou (18), Janet ? (17), –?– (16), –?– (15), Douglas Beswick (14), Nicholas Perkins (13), David Malster (12), Alan Anderson (11). Front row: Jan Prizbycz (?spelling) (34), –?– (33), Angela Jackman (32), Nancy Michael (31), –?– (30), Mary Kimber (29), Gillian Assail (28), Jane Hildebrand (27), Margaret Harris (26), Jane ? (25), Lewis ? (24). The building back left was the boys’ toilets. Other pupils that I can recall joining the class the following year were: Richard Gaston (his father was the caretaker of The Linguists Club in the Duchess of Bedford’s Walk), Teifion Owen (son of the playwright Alun Owen), Paul Holub (a great pianist whose family were originally Polish/Czech), Richard Knapp and Timothy Barnes (parents were licensees of the Harrington Arms, Gloucester Road). Of the pupils detailed above, I can add the following information – David Irving (from Ladbroke Grove), Keith Brantingham (school secretary’s son, his father was the head teacher of a secondary school in south London, they lived in Hammersmith and later Barnes), Peter Protapapa (parents had a Greek restaurant/café in Olympia), David Logan (French, mother was a fine arts dealer, lived in Palace Gardens Terrace), Arthur Neal (father was a secretary to HM Queen and they lived in the Stables, Kensington Palace), Tina Marco (brilliant at maths), Jan Prizbycz (Polish), Angela Jackman (father was an undertaker in Church Street, she was a very good ballet dancer), Nancy Michael (lived in Rutland Gate off Kensington Gore).